In 1901, provincial librarian J. P. Robertson wrote to American philanthropist Andrew Carnegie to request that Winnipeg be given a grant similar to that provided to Ottawa for the construction of a library. In due course, Carnegie donated $75,000 and this building, designed by Samuel Hooper, was erected between 1904 and 1905 by the firm of Smith and Sharp at a total cost of $100,000. It was the city’s first public library. Previously, the library collection had been housed in the City Hall and managed by the Manitoba Historical Society and the city council. Opened officially by the Governor-General of Canada in October 1905, the main floor of the two-storey stone building contained a men’s reading room, ladies’ reading room, general reading room, reference area, book stacks, and offices. The second floor had more book stacks, a children’s department, and a hall used in regular Saturday afternoon lecture series. In 1908, an addition was made with a $39,000 grant provided by the Carnegie Corporation. In 1977, the building was replaced by the Centennial Library (now the Millennium Library, where a painting of Andrew Carnegie by Victor A. Long is displayed) but it continued to be used as the William Avenue Branch in the Public Library system. 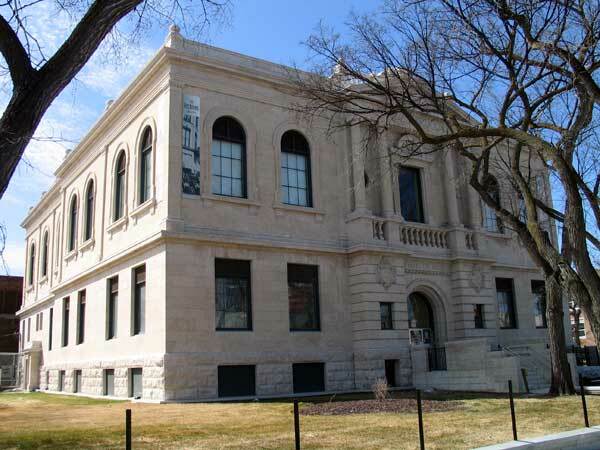 In later years, it also housed the City of Winnipeg Archives containing such items as council minutes, tax rolls, building plans and permits, and a wealth of other materials going back to 1873, with a value appraised for insurance purposes at $4.1 million. The library branch closed around 1995 and the archives occupied the entire space. In 2012, the municipally-designated historic building received a Conservation Award from Heritage Winnipeg. In 2013, the building underwent a major renovation that would have made it a state-of-the-art archival facility, including a temperature- and humidity-controlled storage vault. The building sustained extensive water damage when a hole in its roof was left uncovered by contractors during two major rainstorms. The archival collections were moved out and the building now stands empty. City of Winnipeg Municipal Manuals, City of Winnipeg Archives. Carnegie Library (380 William Avenue), City of Winnipeg Historical Buildings Committee, April 1984.